Coming up this weekend (21st April) is the "Fiesta Latina" which for all intents and purposes strikes me as an opportunity to get your salsa on. 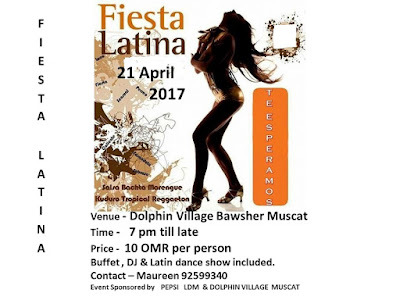 It costs a tenner, starts at 7pm and includes buffet dinner, a DJ and a dance show by a group called Latin Dance Muscat. You can get tickets by calling 9259 9340. So if that's your thing, now you know!